Hope to have something to post in a few days, just want to come up with an idea for pics first. 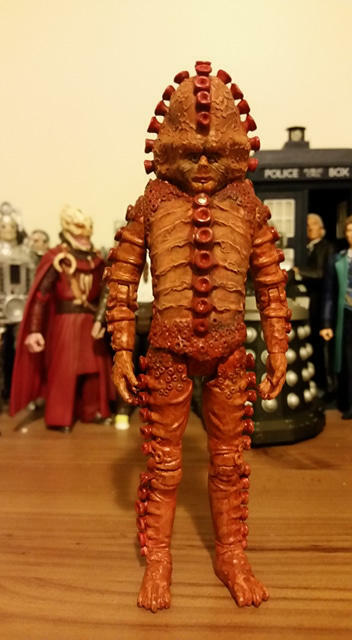 But for now here is a Zygon that I have added a dark wash to to bring out the details more. Not a full custom but I like how it turned out for the most part and it is at least a small update. Last edited by EmeraldThorn on Fri Feb 01, 2019 8:01 pm, edited 3 times in total. I forgot about this Tenth Doctor I worked on several months ago, I repainted his head and hands. Might not be perfect but I am okay with it and my Black Guardian shows how quickly I adapted to painting smaller eyes as they were done around the same time. Last edited by EmeraldThorn on Fri Feb 15, 2019 4:45 pm, edited 3 times in total. "Doctor we must find Barbara and Susan!" Yes it is the one and only Ian Chesterton. Actually finished this guy about a month ago but only just painted his eyes last week. May go back and touch them up as I don't like how the left one sits(his left not ours') That was partially due to the sculpt but I know how I can fix it. I see Steven in it more now than Ian and even the Timelash villain due to the eye but also the nose. I had intended on making him with his more traditional suit and tie look but decided to take this path as I had seen more of that look done than this.I may now never know if I was right in my choice but this is Ian and will be for the foreseeable future, nitpicks aside I am happy with it. Last edited by EmeraldThorn on Fri Feb 15, 2019 4:46 pm, edited 2 times in total. So I came up with this design idea a few months or so back and finally finished this custom a couple of nights ago. He was actually about 98% finished for a long time, but sat while I worked out how to do the lapel pin and what I wanted it to look like, it is actually based on my cat. I like to call this the bumblebee costume, a what if costume had the sixth Doctor got to wear something a little darker but kept some colour to it. I am overall happy with it, I am getting better at pinstripes and while not perfect, I feel the lapel pin is pretty good for my first attempt. May revisit this one down the line once I am better at some things and tidy him up a bit. I made the figure taller with a torso mod and handpainted everything but the hands and head which are factory paint, possibly the easiest bit was the watch chain and buttons oddly enough. While I have still to listen to Full Fathom Five in full this incarnation intrigues me and seeing others' takes on him(such as CaptainJimiPie) made me settle on trying my hand at him. I decided to go with a version based more on the actor's appearance he has had in some of the promotionary material, not as old as he is now but not as young as he is portrayed in some fan art. I sculpted the hair, also there is an alternate hatted head, may try to take pics of that one another time, rest was just modding parts to fit and repainting them. He is another one that sat basically finished for so long, ultimately just needed the eyes, lips, rings and hat band painted but now he is done. 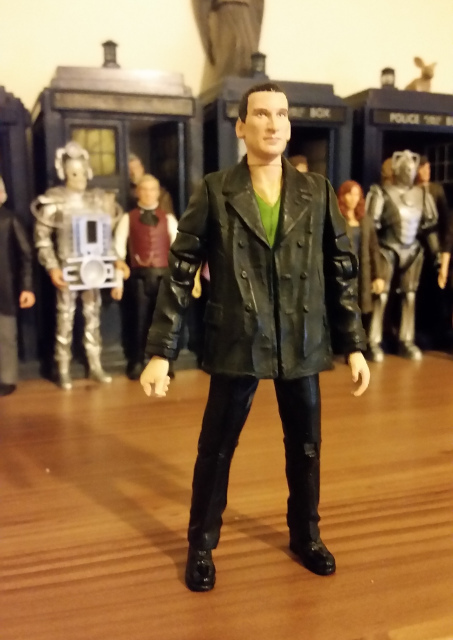 Anyway, here is my take on The Doctor as played/voiced by David Collings in Big Finish's Doctor Who Unbound: Full Fathom Five in which we meet a darker doctor who may just believe the ends justify the means. I do have other alternate universe Doctors etc; in mind aswell. His rings, sorry they aren't the best pics. One is meant to be a silver ring with an emerald and the other is a gold one with a ruby. Last edited by EmeraldThorn on Fri Feb 01, 2019 8:02 pm, edited 2 times in total. EmeraldThorn wrote: While I have still to listen to Full Fathom Five in full this incarnation intrigues me and seeing others' takes on him(such as CaptainJimiPie) made me settle on trying my hand at him. I decided to go with a version based more on the actor's appearance he has had in some of the promotionary material, not as old as he is now but not as young as he is portrayed in some fan art. I sculpted the hair, also there is an alternate head, may try to take pics of that one another time, rest was just modding parts to fit and repainting them. I consider that a big compliment, it was your custom that got me intrigued in the Unbound universe to begin with, even been considering making a second body to give him an alternate costume colour scheme. Thank you for that and no problems. 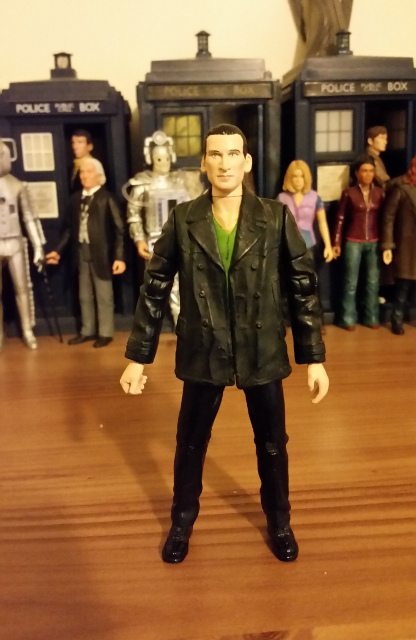 I not too recently managed to get a couple of the 13th Doctor figures(plan to get more) and was just wondering what those who have done her alternate looks used to get the screen accurate(or close to it) colour for her alternate shirts? Finally got around to making a Resolution 13, didn't take too long and colours turned out darker than I intended, especially on the scarf which isn't the neatest it could be, but given I am not good at thin stripes and I did them by hand I am happy they came out as tidy as they did, might redo them down the line. The blue of the shirt went on the right colour but dried darker than expected, had I lightened it though it likely would have turned out too pale. Plus I remember in the story it changed based on lighting. Some scenes it looked only a little lighter than her main shirt, others lighter. Though not always as light as the promo photos which makes sense as they would have been overlit. Case and point the War Doctor promo photos. Also sorry the pics came out blurry but these were the best, will add better ones later on. Anyway here she is 13 in her Resolution attire, might take a pic without the scarf later also.